Feeding dairy cows microalgae may be the answer to adding more omega-3 to dairy products a PhD student has found. 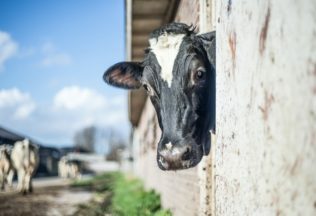 Bethan Till, who is undertaking a PhD at Harper Adams University in the UK, increased the level of long chain omega-3 while reducing the level of saturated fatty acids in cheese by feeding cows microalgae. The omega-3 content was increased without altering the taste of the cheese either. Ms Till said the aim of feeding the cows microalgae was to improve how healthy dairy products can be. “Western diets are providing less than recommended levels of long chain omega-3 polyunsaturated fatty acids which are beneficial to human health,” Ms Till said. “Fish is typically regarded as a natural source of omega-3s but the levels are diminishing and less fish is being consumed. “By increasing the level of omega-3 in cheese, which is already integrated into many people’s diets, they can have this healthier benefit without having to alter their eating and shopping habits. Microalgae is at the bottom of the food chain and is eaten by fish, making it rich in omega-3. The study was conducted on high yielding Holstein Friesian dairy cows that were given one of four diets. Three of the diets included microalgae at different levels, with a medium amount determined the best for producing the omega-3 cheese. “From the cheese tasting panel, we found that there were also no negative effects on taste,” Ms Till said. Ms Till and other researchers are now studying whether microalgae improves fertility in cows. Although it is too early for any results, another study from the US has found microalgae did improve fertility in dairy cows. Domino’s has lifted its earnings forecast for the 2017 financial year.